This parish-based marriage enrichment provides an excellent opportunity to touch the lives of married couples in each parish. Some will already be thinking about getting involved in the work of marriage preparation, others attend simply for a boost for their relationship. At the completion of this time of study, discussion, and prayer participants are invited to prayerfully consider becoming a lead couple and attend the second part of the training process. 8:25 Closing prayer and invitation to form a study group for the One in Christ: A Spiritual Workout, a guided study of the USCCB document Marriage: Love and Life in the Divine Plan. Growing in Love is offered free of charge. 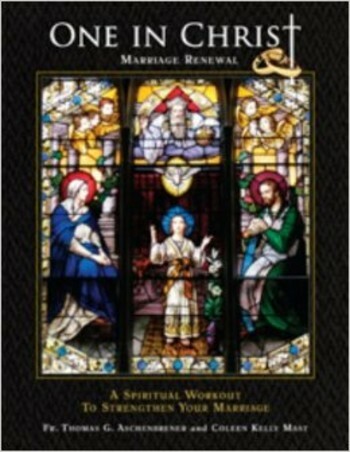 The parish chooses one couple to facilitate the One in Christ: Marriage Renewal study. Following the Growing in Love introductory session parishes form a group (or several groups) of those interested in the full One in Christ study. The study follows a self-study model with 4 meetings of group discussion and sharing. The 4 month program includes one private home study per week and one group study per month. The 4 month pace accommodates those with a busier lifestyle. There is also an option to do the study as a group using a 1 month pace which completes the entire study much more quickly for those who would like to do so. One in Christ study materials cost only $20 per couple. Our office provides publicity materials and helps each parish organize the study group(s). Please refer your questions to Dino Durando email / (816) 714-2371.